uuid : 471a1f6f-2062-4e0e-8e39-17d91a35e9a5 templates_id: 119553 templates_uuid: "6eacc9f0-084a-41a2-ae40-d48ee83251e1" title: "Rent Demand Letter - Create an Overdue Rent Letter Online" display_name: "Rent demand letter" meta_keywords: "Rent arrears letter" description: "
Provide your tenant with this rent demand letter when, for the first time, they\'ve missed paying rent on the due date. This straightforward notice enables you to request immediate payment of the outstanding rent from your tenant. With this rent demand letter you can also request that all future rent payments are made in full on the due date. What is a rent demand letter? A rent demand letter is a letter requesting immediate payment of the outstanding rent from a tenant. It notifies the tenant of their failure to pay rent, and it is the first step to recover overdue rent. Why do you need a rent demand letter? Issuing a demand for rent serves a reminder to the tenant that rent is due, and warns them that further failure to pay may lead to eviction. Communicating with your tenant by sending them a letter may be enough to solve the issue and avoid eviction. It is also a valuable document in case of further legal action. When is rent considered overdue? Rent is considered overdue as soon as a tenant has not paid the rent on the date specified in their tenancy agreement. However, a slight delay in paying rent can sometimes happen, so the first rent demand letter should reasonably be sent on the 7th day of arrears. How much notice should you give the tenant? The letter should indicate that payment must be made immediately. This will help you deal with rent arrears quickly and efficiently. Can an agent serve the letter on the landlord\'s behalf? Yes, if the tenancy agreement is signed through an agency, a rent arrears letter can be issued by the agent on the landlord\'s behalf. What processes should be followed if rent remains unpaid after issuing the arrears demand letter? If after sending a first letter to your tenant, rent remains overdue and unpaid, you can serve them a final rent demand letter to request immediate payment of the outstanding rent. \r\nThe next step is to serve your tenant with a notice for repossessing property, by issuing an eviction notice. Are there are reasons why outstanding rent may not be claimed? If the tenant refuses to respond to the rend demand letter, the landlord may need to take the matter to court. It will then be up to the court to determine if a landlord is entitled to claim rent arrears. This rent demand letter is governed by the law of England and Wales. \r\n" created_timestamp: "2018-10-08 04:36:54.0" modified_timestamp: "2018-10-08 04:36:54.0" active: true created_by: 246 modified_by: 246 dcm_id: 305 url_slug: "First-rent-demand-letter" meta_description: "Prepare a rent demand letter\302\240when your tenant\302\240did not\302\240pay the rent on time\302\240with help from Rocket Lawyer.\302\240You will need this letter to request immediate payment from the tenant. Try our rent demand letter." time_to_complete: "10 minutes"
Provide your tenant with this rent demand letter when, for the first time, they've missed paying rent on the due date. This straightforward notice enables you to request immediate payment of the outstanding rent from your tenant. 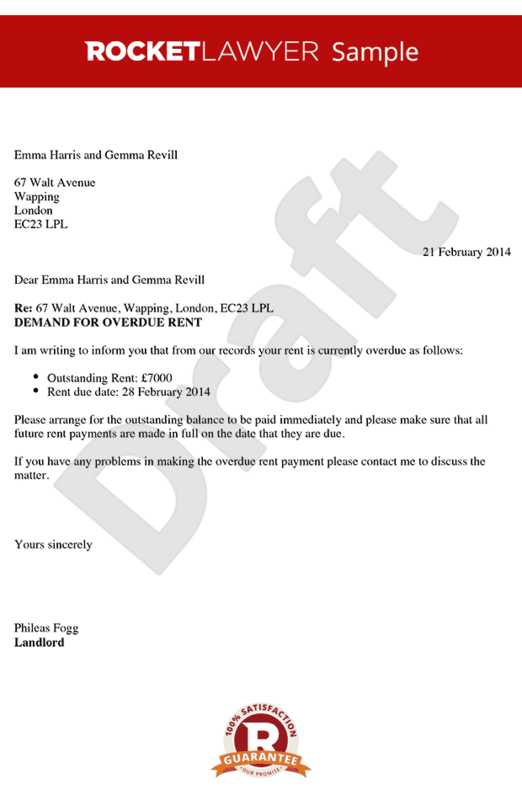 With this rent demand letter you can also request that all future rent payments are made in full on the due date. Can an agent serve the letter on the landlord's behalf? Yes, if the tenancy agreement is signed through an agency, a rent arrears letter can be issued by the agent on the landlord's behalf. If after sending a first letter to your tenant, rent remains overdue and unpaid, you can serve them a final rent demand letter to request immediate payment of the outstanding rent. The next step is to serve your tenant with a notice for repossessing property, by issuing an eviction notice. More than just a Rent demand letter template, our step-by-step interview and guidance makes it easy to create your document. Easily create online, download, print and sign your free Rent demand letter in minutes. This document is also sometimes called: Rent arrears letter.